Contradiction thy name is rains. On one hand they conjure an image of cozy indoors, poetic reflections or a meal of piping-hot bhajjiyas and masala chai. The other end of the spectrum is not so privileged. For many, monsoon spells damage, destruction and disorder. Escapist to its core, Bollywood, however, spares no opportunity to squeeze in an artificial shower, either to highlight the heroine's laboriously-achieved curves or the sizzling equation between the movie's leads. With monsoon making its presence felt in many parts of the country, rediff.com offers you to vote for your favourite tracks of the genre. 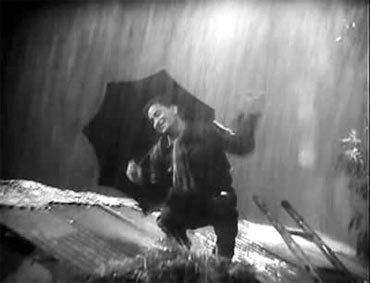 While Raj Kapoor and Nargis gazing into each other's eyes under a singular umbrella amidst heavy downpour continues to be an iconic image in Hindi cinema; it's not really a monsoon melody. On the other hand, RK's gay gambol, loyal umbrella intact, in Chhaliya's Dum dum diga diga celebrates the arrival of rain with terrific spontaneity. In Bimal Roy's engaging fable, a plainly-clad Sadhana, sans her trademark fringe, is a picture of demure grace even as she reveals her inner romantic via Lata Mangeshkar's utterly gorgeous rendition of O sajna barkha bahar aayi. God bless LP for infusing some charm in the otherwise contrived tripe about poor boy-meets-rich girl with their stirring compositions. Especially the rain ditty, Rimjhim ke geet -- picturised on a super coy Babita wrapped in an off-shouldered floral cloth, a rather bold display for the 60s, resists the careful advances of Rajendra 'Jubilee' Kumar with all her might (read pout). Rains and romance go hand in hand. Soaking in Mumbai's torrential rains to the hilt, Amitabh Bachchan and Moushumi Chatterjee frolic all about Marine Drive with RD's breezy Rimjhim gire sawaan constituting the backdrop. On screen newly-weds Rajesh Khanna and Zeenat Aman enjoy Bollywood-sponsored showers to make out on the terrace with generous help from RD's Bheegi bheegi raaton mein for Shakti Samanta musical drama, Ajnabee. Later that year (1974 to be precise), the actress made a sopping statement, drenched to the bone, romping on a roof top to grab Manoj Kumar's attention with Hai hai yeh majboori (Roti Kapda Aur Makaan). Trust a jaunty Big B to rub off some of his playful disposition on the usually reserved Smita Patil as they both get a wild taste of monsoon while shaking a leg to Bappi Lahiri's highly-animated Aaj rapat jayein in Namak Halal. All that thunder and lightning brings out the frightened bunny off our Bollywood divas. And so Betaab's freshly launched duo of Sunny Deol and Amrita Singh make most of their confinement in a quaint glass house thanks to the deluge outside. Poor Vinod Khanna is not so lucky. Chandni's mellifluous albeit melancholic Lagi aaj sawaan serves as a painful reminder of his character's heartbreaking past. Then again, the camera and the audience are more concerned about Juhi Chawla and Sridevi's dreamy swirl under the Yashraj-created downpour. A remarkable soundtrack from RD on all counts, 1942: A Love Story features the ever-dapper Anil Kapoor and just-married Manisha Koirala romance the rains, vintage style against the dew fresh notes of Rimjhim rimjhim. Urmila Matondkar channels the water nymph within as she strikes some ultra-hot poses against a random pole in a figure-hugging sari to the wistful beats of Vishal-Gulzar's terrific combination. Sureela paani, indeed. Chemistry explodes through every pixel of the screen as Akki and Raveena indulge in a dripping game of seduction to Viju Shah's vigorously catchy, Tip tip barsa. Gosh, the repeat value! Dahek may have been cold turkey at the box office but continues to make its presence felt every monsoon. Especially on radio, courtesy its fabulously lilting yet underrated track, Sawaan barse, showcasing the endearing twosome of Akshaye Khanna-Sonali Bendre experiencing the first throes of love. Can't imagine Humphrey Bogart and Audrey Hepburn do this! You know? Splash their feet and hop all over the place like only Akshay Kumar and Kajol can in this trippy adaptation of Sabrina. There's nothing in-your-face about Tabu's sensuality. Watch her tiptoe in the company of raindrops in the Rahman-helmed Boondon se baatein, you'll know what we mean. The Oscar-winning composer later used the tune as Manasukkul oru puyal in the Tamil flick, Star. Besides garnering critical acclaim to Kareena Kapoor for her acting chops as a golden-hearted streetwalker in and as Chameli, the soundtrack gained popularity on the music charts for Shandilya's breezy score. The soothing texture and monsoon-influenced flirtations of Behta hai mann being one of them. A whiff of petrichor and gray clouds envelops the senses as Aishwarya Rai Bachchan lets her hair down without a care in the world to the feverish chants of Guru's Barson re against Mani Ratnam's stunning imagery of bucolic life and landscapes.